“I found myself getting distressed over how divided my fellow Americans were becoming as a result of being targets of political ideology, and I knew that my only way through it was to try to make something funny out of it.” said Motel. 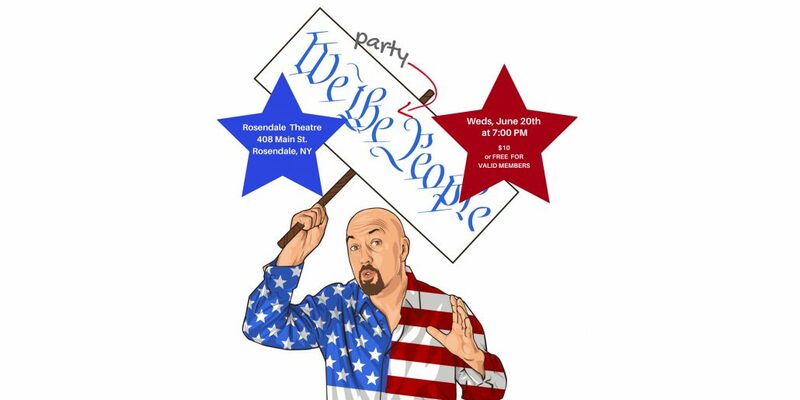 The Rosendale Theatre announces that L.A. Weekly Award-winning playwright and performer Doug Motel (Shiva Arms) will return to the stage as a cornucopia of funny new characters in WE THE (party) PEOPLE, a smart new solo show that explores reactions to the phenomenon of Donald Trump’s Presidential election. We The (Party) People presents a gallery of sixteen American and immigrant characters all with strong opinions or connections to Donald Trump. From founding father (and electoral college proponent) James Madison to Scottish immigrant Mary Anne Macleod (Trump’s mother) we meet people that are both funny and poignant in outrageous portraits that manage to preserve the character’s full humanity. Written and performed by Motel and directed by Susan Einhorn, this staged reading will run one night only Wednesday, June 20 at 7 PM in the Rosendale Theatre 408 Main Street in Rosendale NY 12472. Running time is approximately 70 minutes. General admission tickets are on sale for $10 (free for Rosendale Theatre members) at www.dougmotel.com and at the theater. DOUG MOTEL (Writer, Performer) The New York Post said: “Like Lily Tomlin, Doug Motel is one of those rare comedians who creates and becomes totally original characters.” Mr. Motel is the author of several solo plays including MIND SALAD (L.A. Weekly Award nomination for writing and performing) and SHIVA ARMS (winner L.A. Weekly award for writing and performing and winner Theatre LA Ovation award for Best Writing of a World Premier play.) His most recent solo show THIS IS THE SHOW was a pop musical that he also composed the music for. Films and TV credits include BURN (thriller coming to theaters in 2018) THE WAITING GAME, (winner San Diego International Film Festival: Audience Award, Best Independent Feature) as the evil Russian villain on THE TICK (Fox TV). TONYA: THE BATTLE OF WOUNDED KNEE (Showtime), and more. Doug Motel is a portrait artist whose paintings will be featured at The Rosendale Cafe’ throughout June, and he is the author of the personal growth book: “TODDLER WISDOM: FIVE POWERFUL THINGS YOU CAN LEARN FROM WATCHING 2-YEAR-OLDS”. SUSAN EINHORN (Director) has directed over 85 professional productions of plays, musicals, and operas, and considers her specialty to be nurturing and developing new work, of which she has done over 40 premieres, many of which have been published. NYC theatres include: Westside (I CAN’T KEEP RUNNING IN PLACE), Circle-in-the-Square (SPARE PARTS), Theater for the New City (FINDING CLAIRE and STARRY MESSENGER), Playwrights Horizons, Vineyard, Primary Stages, LaMama, Jewish Rep, Open Space, and HB Playwrights Theatre, among many others. Major regional theatres include Pittsburgh Public (five productions), Syracuse Stage, Studio Theatre, Arena Stage, Milwaukee Rep and Whole Theatre. She was the Artistic Director of (and directed many plays in) the two new short play festivals: The Rosendale Theatre Plays and The Movie Plays at the Rosendale Theatre. She is a professor of theatre at Queens College, CUNY, where she has headed the acting program for 35 years.